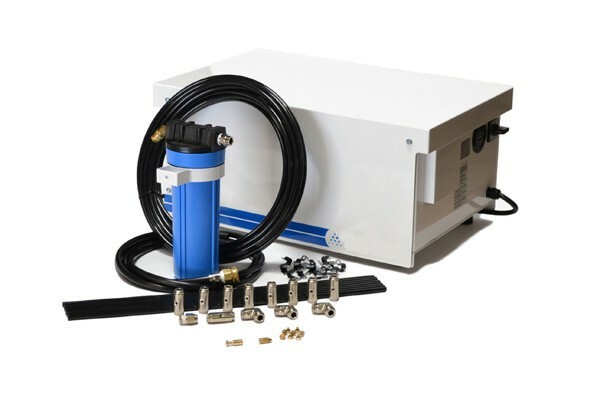 This kit includes all of the components needed to install a 100′ fog system. 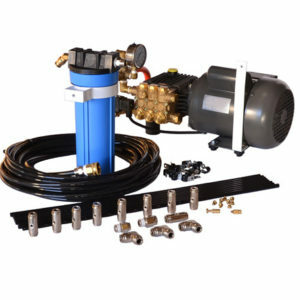 Included is our Continuous Duty Pulley Drive pump which is rated for 24/7 use, quick connect fittings, fog nozzles as well as all of the required tubing, fittings and inlet filtration. 1 – 100′ Roll of Semi Flexible Nylon Tubing – 3/8″ O.D. 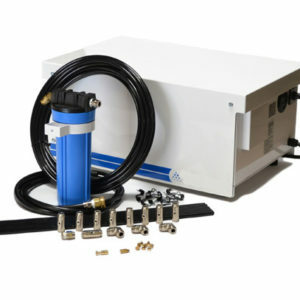 Many professionals and hobbiests prefer a pulley driven fog pump over a close coupled pump. A pulley driven high pressure fog pump is much more forgiving than a close coupled system and will provide years of uninterrupted and reliable service. Several models are available suitable for a small greenhouses or patio application to larger warehouse or commercial type projects.